If years of stubborn stains have left your teeth appearing discoloured, we can help you achieve a megawatt smile with Zoom In-chair whitening. In one visit to Incredible Smiles, you can get the gleaming white smile you’ve always wanted. These Frequently Asked Questions about Zoom will give you the information you need to make your teeth whitening decision. 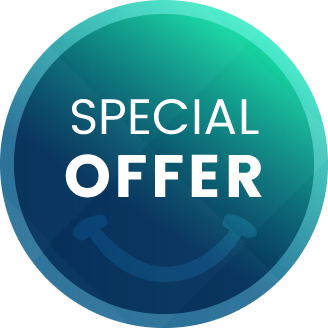 Make sure to check our special offer on Zoom! Teeth Whitening! This whitening system uses a 6% hydrogen peroxide gel to remove the stains that have built up on the enamel of your teeth. As our dentists are highly skilled at performing Zoom teeth whitening properly, your teeth appear naturally white—at least six shades whiter on the whitening chart. While you may experience minor tooth sensitivity during or after the whitening process, the sensitivity lasts no more than 48 hours. During that time, you should avoid consuming hot or cold foods and drinks. The application process isn’t painful, and most patients report experiencing no discomfort during or after the process. What does the in-office procedure involve? A specially formulated gel will be applied to your teeth, covering the gums and soft tissue with a gingival dam barrier and a disposable face guard. Your dentist will then use the Zoom Whitespeed Laser to activate the gel and to speed up the drying process. The in-office procedure takes about an hour, so you can whiten your teeth over your lunch break. Will I get similar results with over-the-counter whitening products? No; that’s because the gel that the whitening kits contain is of a limited strength so you won’t be able to achieve the dazzling results you’d get with Zoom professional teeth whitening. If you refrain from consuming staining foods and beverages, you should enjoy your results for many months. Practicing good oral hygiene and coming in for checkups every six months will help your results last longer. No; many dentists consider teeth whitening to be the safest cosmetic dental procedure as long as it’s performed under the supervision of a licensed dentist. In addition to giving you a bright and beautiful smile, teeth whitening also can boost your confidence. Whitening your teeth can help you make a fantastic first impression in your personal and professional life. And with the holidays on the horizon, you can achieve a gleaming smile in time for all the seasonal festivities. Incredible Smiles is now featuring a whitening special: get in-chair whitening for $599, home whitening kits for $350 or a combination of both for $750.